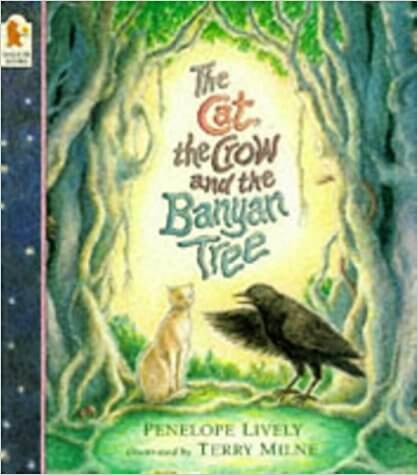 The cat and the crow live under the huge and mysterious banyan tree. All day long they tell each other stories: the cat’s are elegant and entertaining, the crow’s fast and furious. One day, they decide to tell extra special stories, each of which involves them climbing inside the banyan tree. The cat takes the crow up and up, through the tall tree and out into the sky, where they board a shooting star and fly to the highest mountain of the moon. Then they climb down again. Now it’s the crow’s turn. Cat jumps on his back and they’re off and rushing – for in crow’s story they’re being chased by hullaballoos. They dodge the glockenspiel, race through the ghost tunnel, past the snake gang and back, to the cat’s great relief, to the bottom of the banyan tree. And. the book ends, in classic style, with tea!